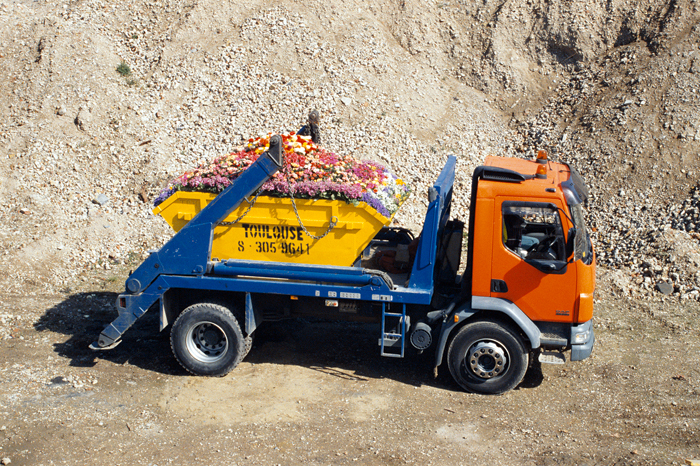 A brightly coloured skip, the type commonly associated with the disposal of debris and unwanted waste, has been planted to brim with an impressive display of flora. Long, who made this temporary artwork in conjunction with Toulouse Skip Hire of London, selected the company on the basis of their exotic name and for the visually striking nature of their identity colours, an aesthetic criteria which he also applied to the choice and variety of flower incorporated in this sculpture. The title of this artwork not only brings to mind Skip to my Lou, a popular folk song of courtship and love, but also suggests the presentation of an elaborate gift or gesture. This offering can either be read as one from the artist to the viewer or, imagined in the third-person, from the operator of the vehicle to an individual of his choosing. Skip, My Darling speaks of abundance, growth and matrimony, the unlikely congruity of opposite elements and the impermanence and the fragility of union.